Even at 22, Fender was an accomplished farmer. The following will show the result of Capt. 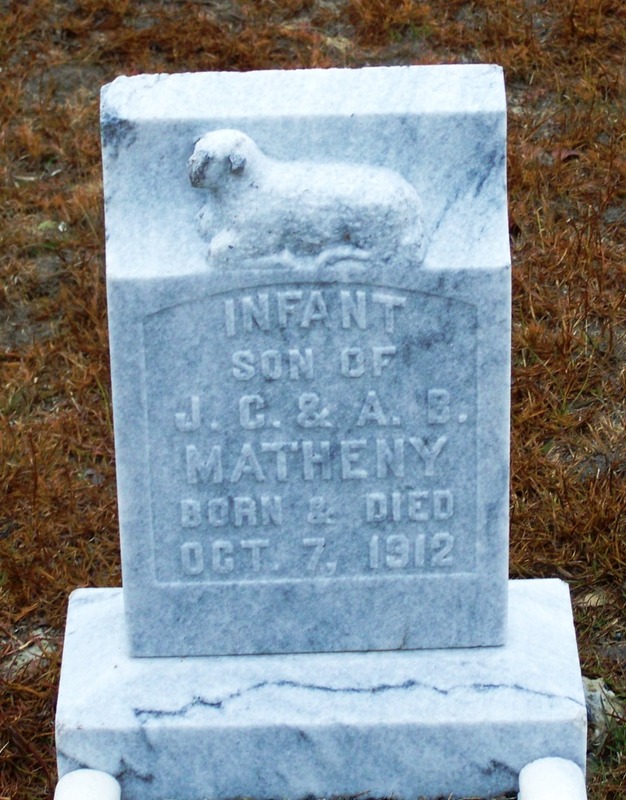 J. W. Staten and Mr. George W. Fender’s experience in fattening pork in Echols County: Capt. Staten killed four, fourteen months old, that weighed 217 ¾ pounds. Mr. Fender killed one of the same stock, two years old, that weighted 457 pounds. This shows what can be done in raising our fattening hogs in Southern Georgia. I have never seen fatter hogs in Kentucky, or in any other State in the Union. It is a stock that the captain has improved by crossing the common piney woods rooter with others and selecting the best pigs for breeders. Ex-Governor Brown said in a lecture before an agricultural committee, in 1868, that pork could be raised cheaper in Southern Georgia than in Cherokee, by sowing rye for grazing, and pinders for fattening. Will not our people profit by this example. R.W.P. Perhaps George W. Fender followed the advice of Governor Brown to fatten his hogs. It wasn’t long before pinders, also known as peanuts, were widely recognized as prime feed for fattening hogs. Beyond a doubt, the peanut is the coming crop for the hog farmer. An acre of peanuts will produce as much pork as three acres of average corn. No trouble about gathering the crop. Just mow the tops for hay and let the hogs gather the nuts themselves. ~ Modern school store. (1917). Chicago. In their heyday, soda fountains flourished in pharmacies, ice cream parlors, candy stores, dime stores, department stores, milk bars and train stations. They served an important function as a public space where neighbors could socialize and exchange community news. 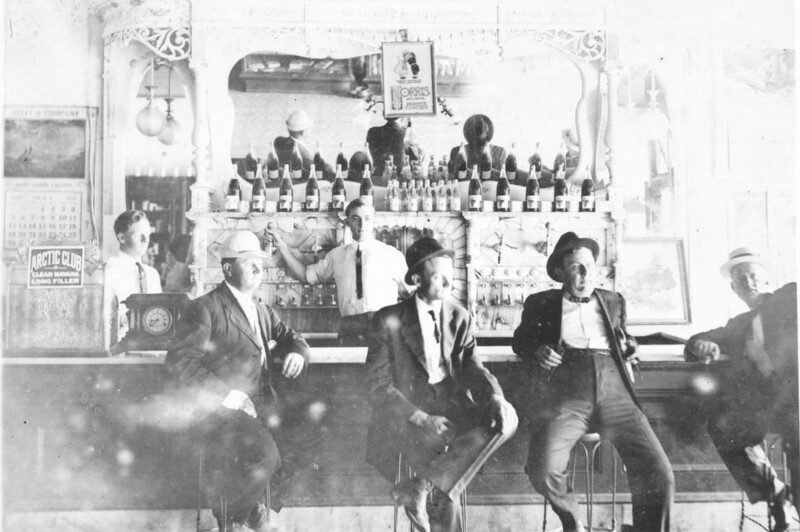 In the early 20th century, many fountains expanded their menus and became lunch counters, serving light meals as well as ice cream sodas, egg creams, sundaes, and such. Soda fountains reached their height in the 1940s and 1950s. With the coming of the Car Culture and the rise of suburbia, they began to decline. Drive-in restaurants and roadside ice cream outlets, such as Dairy Queen, competed for customers. North American retail stores switched to self-service soda vending machines selling pre-packaged soft drinks in cans, and the labor-intensive soda fountain didn’t fit into the new sales scheme. Today only a sprinkling of vintage soda fountains survive. The 1910 census of Ray City shows seventeen year-old Lutie Fender working as a “soda fountain salesman” – a soda jerk. Lutie was the son of Ray City hotelier, Wilson W. Fender, and nephew of Lon Fender, turpentine operator and builder of the Patterson Hotel in Valdosta, GA. The Fender Hotel was was one of the historic businesses of Ray City. 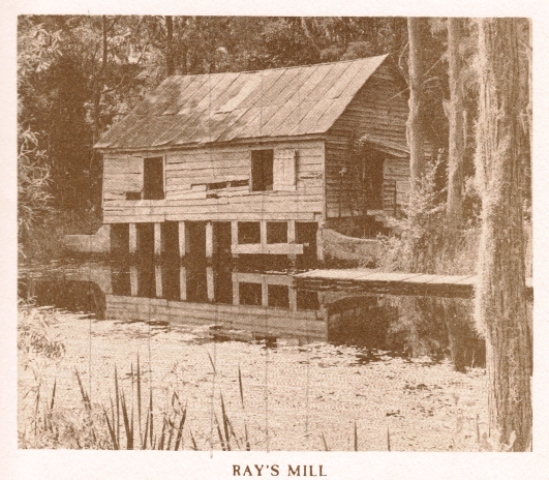 It was located in a wooden building on the northeast corner of Main and Paralleled Street in Ray City, just across the track from the train depot of the Georgia & Florida Railroad. The hotel was operated by Mrs. Lena Fender. This building was destroyed by fire in 1913 or 1914. “I went to work at… Terry’s Drug Store, down the street. I was a full fledged Soda Jerk, working in afternoons after school, and Saturdays. They had sandwiches made from ham boiled in the back of the store, boiled peanuts, boiled in the back, pimento cheese mixed in the back, with lettuce and tomato. I went to work after school each day and left after closing at 9 PM. All the soda fountain was my specialty, too. On Saturday I worked from 10 am until closing at 11 PM. I was paid $2.50 a week. I continued working at Terry’s Drug Store off and on until I graduated from high school.” – Paul J. Tanner, M.D. 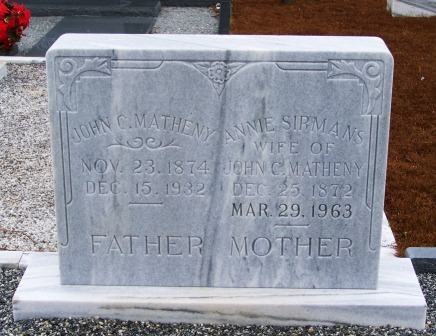 Sarah Knight, daughter of Ann D. Clements and General Levi J. Knight, was born 06 April 6, 1831 in Lowndes, Co., Ga. 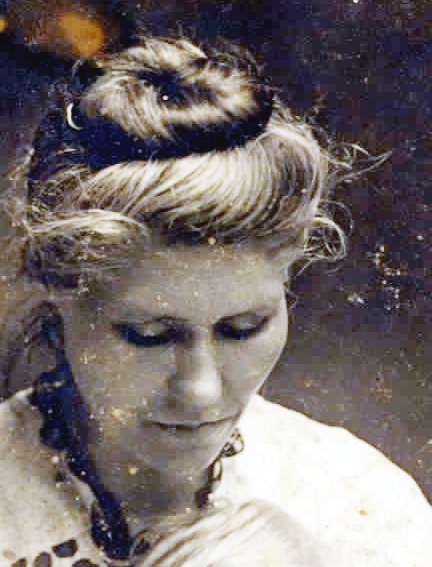 Her husband, Gideon Gaskins, died during the Civil War. He was a son of Polly Barrow and John Gaskins. 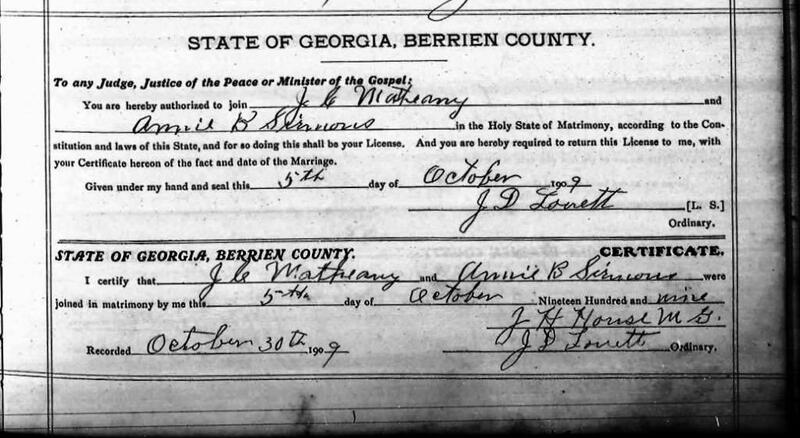 On September 19, 1863, Levi J. Knight applied to become guardian of the children of his deceased son-in-law, Gideon Gaskins. The required legal advertisement ran in the newspapers at Milledgeville, GA then serving as the state capitol. Milledgeville Confederate Union, Oct. 13, 1863. Whereas Levis J. Knight applies for letters of Guardianship of the person and property of the minor heirs of Gidieon Gaskins. All persons interested will file their objections if any in my office by the first monday in November next orterwise letters will be granted. With the death of her husband, Sallie was left a widow with six children, one a newborn, to raise on her own. 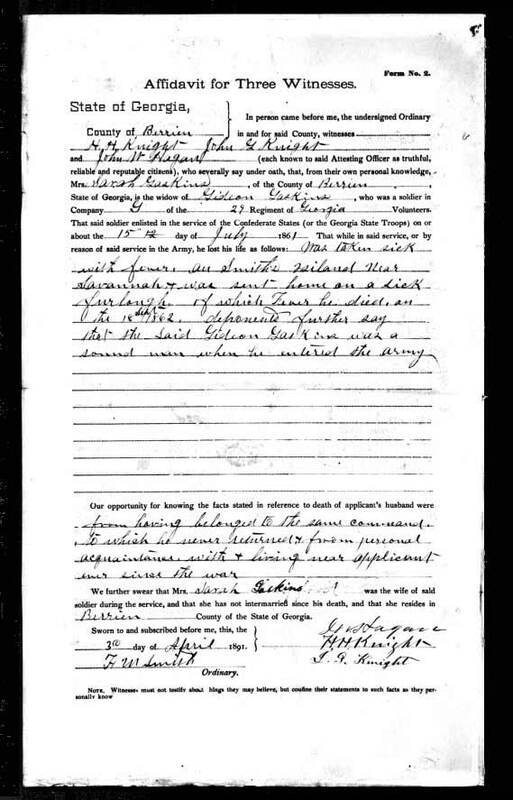 In 1891, Sarah “Sallie” Gaskins applied for and received a Confederate Widow’s Pension of $100.00. Her claim was based on the fact that Gideon Gaskins had died in the army of disease contracted while in the service. 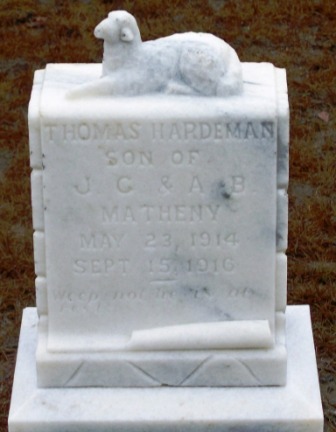 Henry Harrison Knight, John G. Knight, and John W. Hagan all signed the affidavit attesting to the service and good standing of Gideon Gaskins. She continued to receive the yearly pension payment through her death in 1903.